Bitter orange (Citrus aurantium) extract is widely used in dietary supplements for weight management and sports performance. Its primary protoalkaloid is p-synephrine. Most studies involving bitter orange extract and p-synephrine have used products with multiple ingredients. The current study assessed the thermogenic effects of p-synephrine alone and in conjunction with the flavonoids naringin and hesperidin in a double-blinded, randomized, placebo-controlled protocol with 10 subjects per treatment group. Resting metabolic rates (RMR), blood pressure, heart rates and a self-reported rating scale were determined at baseline and 75 min after oral ingestion of the test products in V-8 juice. A decrease of 30 kcal occurred in the placebo control relative to baseline. The group receiving p-synephrine (50 mg) alone exhibited a 65 kcal increase in RMR as compared to the placebo group. The consumption of 600 mg naringin with 50 mg p-synephrine resulted in a 129 kcal increase in RMR relative to the placebo group. In the group receiving 100 mg hesperidin in addition to the 50 mg p-synephrine plus 600 mg naringin, the RMR increased by 183 kcal, an increase that was statistically significant with respect to the placebo control (p<0.02). However, consuming 1000 mg hesperidin with 50 mg p-synephrine plus 600 mg naringin resulted in a RMR that was only 79 kcal greater than the placebo group. None of the treatment groups exhibited changes in heart rate or blood pressure relative to the control group, nor there were no differences in self-reported ratings of 10 symptoms between the treatment groups and the control group. This unusual finding of a thermogenic combination of ingredients that elevated metabolic rates without corresponding elevations in blood pressure and heart-rates warrants longer term studies to assess its value as a weight control agent. The bioflavonoids hesperetin and naringenin are widely distributed in citrus fruits and juices as their glycosides, hesperidin and naringin, respectively. They are present in Citrus aurantium as well as a wide variety of other Citrus species . The sugar moieties for both flavonoids consist of rhamnose plus glucose, which must be removed in the intestinal tract before the flavonoids can be absorbed [2, 3]. The absorption of these flavonoids in human subjects has been extensively studied and depends in part upon the forms in which they are ingested (juice or fruit, glycoside or aglycone, capsule, tablet, etc.) [4-8]. Experiments involving human subjects, animals and cell culture systems have shown that the two flavonoids exhibit a wide range of potentially beneficial physiological and biochemical effects. Naringen and/or hesperidin or their aglycones have been shown to improve insulin sensitivity and glucose tolerance , prevent accumulation of triglycerides , inhibit cholesterol biosynthesis [10, 11], and serve as antioxidants and anti-inflammatory agents [12, 13] as well as hepatoprotectants  and neuroprotectants . However, the effects of naringin and hesperidin on metabolic rate and energy utilization have not been previously assessed. Studies have suggested that p-synephrine has thermogenic and lipolytic activities [16-18], increasing energy metabolism [19, 20] as well as athletic performance . p-Synephrine is the primary protoalkaloid in bitter orange extract which is derived from the immature fruits of Citrus aurantium [22-25], and is widely distributed in other Citrus species [22, 23, 26]. The safety of p-synephrine and bitter orange extract has recently been reviewed , and based on the available studies in animals, humans and cell culture systems, it has been concluded that when taken orally and in recommended amounts both are safe. p-Synephrine is widely used in combination with caffeine and other ingredients in products designed to support weight management [19, 28]. However, no studies have been reported comparing the thermogenic effects of p-synephrine when combined with the flavonoids hesperidin and naringin. This pilot study was designed to examine these effects using a comparative effectiveness research (CER) study design  in a double-blinded, randomized, placebo-controlled protocol to compare the effects of p-synephrine alone and in combination with different amounts of hesperidin and naringin on: (1) resting metabolism, (2) blood pressure, (3) resting heart-rate, and (4) self-reported mood/energy levels in healthy human subjects. A total of 50 participants gave written informed consent in compliance with the Helsinki Declaration and approved by Integrative Health Technologies' Ethics Committee. Participants fasted for 8-10 hours without consuming caffeinated beverages, nicotine, exercising or participating in vigorous physical activities. Upon reporting to the research center, participants completed the 10-item self report in Table 1. After remaining seated in an isolated area for 10-15 min., participants completed measurements of their blood pressure, resting heart-rate and resting metabolism using Micro Life's MedGem® Indirect Calorimeter (Microlife Medical Home Solutions, Golden, CO. 80401). The MedGem® is a hand-held, self-calibrating calorimeter that measures oxygen consumption (VO2) to determine resting metabolic rate (RMR). In conjunction with the study, test-retest reliabilities of the instrument were measured on 41 subjects from test-retest periods ranging from 1-17 days between tests. The average reliability coefficient was 90.2 %, a coefficient that was consistent over the four test-retest periods. p-Synephrine was administered in the form of the patented bitter orange extract Advantra Z® which contained 60 % of this active material. Naringin and hesperidin were 96 % pure. All test materials were obtained from Nutratech Inc. (West Caldwell, NJ). Self Ratings Completed at Baseline, 45 and 75 minutes. After remaining seated and resting for 45 min., participants completed a second self report rating scale. After 75 min., a third and final self report rating scale was completed, and measurements of blood pressure, heart-rate and RMR were determined. ANOVAs were calculated between the groups' baseline, ending and change scores for each treatment group in addition to Dunnett's t-test between each of the treatment groups and the placebo group. Figure 1 shows the changes in resting metabolic rates (RMRs) from baseline expressed as kcals for each of the treatment groups (N=10 per group). As expected, a small decrease occurred in the RMR of the placebo group since these participants continued their 8-10 hour fast (Group1). Increases occurred in the RMR of all treatment groups. As compared to placebo, 50 mg p-synephrine (Advantra Z®) alone (Group 2) more than doubled consumption by 65 kcals over placebo. In Group 3, adding 600 mg naringin to the 50 mg p-synephrine further increased calorie consumption more than three-fold to 122 kcals over placebo. The addition of 100 mg hesperidin to the p-synephrine plus naringin in Group 4 resulted in a further increase in calorie consumption by 5-fold to 183 kcal over placebo. However, in Group 5, when the amount of hesperidin consumed in conjunction with the 50 mg p-synephrine plus 600 mg naringin was increased to 1000 mg, the increase in calorie consumption over placebo was only 79 kcal, an increase between calorie consumption in the absence of hesperidin and in the presence of 100 mg hesperidin. In spite of the low levels of statistical power in these groups of only 10 subjects, the increases in RMR in Group 4 was significantly greater than placebo (P=0.039) and Advantra Z alone (Group 2). It is also worth noting the a repeated-measures Students' t-test revealed that the changes from baseline in Group 3 and Group 4 were both statistically significant (P=0.001 and 0.030, respectively). Table 2 shows changes in blood pressures and resting heart-rates from baseline to the ending test for each of the five study groups. The average baseline blood pressures and resting heart-rates for the study cohort were well within the normal ranges of 121/74 mm Hg and 70 BPM. At the conclusion of the study (75 min. ), no increases in either systolic or diastolic blood pressures or heart rate were observed. None of the baseline-ending changes approached statistical significance nor were there any statistically significant differences between any of the five study groups. Table 3 depicts the results of the self-report ratings for the 10 symptoms. As compared to the placebo group, none of the changes in these 10 self-reported symptoms were statistically significant either 45 or 75 min. from baseline. No significant effects relative to the placebo group were observed by the participants in the four treatment groups for symptoms including anxiety, hunger, tension, sleepiness, energy, nervousness, headache, upset stomach, concentration or general discomfort. 1ANOVA. Placebo: V-8 juice only, T2: 50 mg of p-synephrine (Advantra Z®). T3: p-synephrine + 600 mg naringin. T4: p-synephrine + 600 mg naringin + 100 mg hesperidin. T5: p-synephrine + 600 mg naringin + 1,000 mg hesperidin. Each value is the mean with the standard deviation for 10 subjects. Mean changes from baseline in each rating for placebo and each treatment group with p values for between groups comparisons between placebo and treatment groups. Using a double-blinded, randomized, placebo-controlled protocol, this study compared the effects of 50 mg p-synephrine (as Advantra Z®) alone with three different amounts of hesperidin and naringin on: (1) resting metabolism rate, (2) blood pressure, (3) resting heart-rate, and (4) self-reported mood/energy levels in healthy human subjects. As expected, the RMR of the placebo group decreased over the 75 min. test-retest period since subjects continued the 8-10 hour fast they began prior to the start of the study (Figure 1). The addition of p-synephrine, hesperidin, and naringin led to increases in RMR over placebo. However, while adding 100 mg of hesperidin in Group 4 led to an increase in RMR over placebo, an unexpected reduction was observed in the RMR in Group 5 which received 1000 mg hesperidin as compared to Group 4. 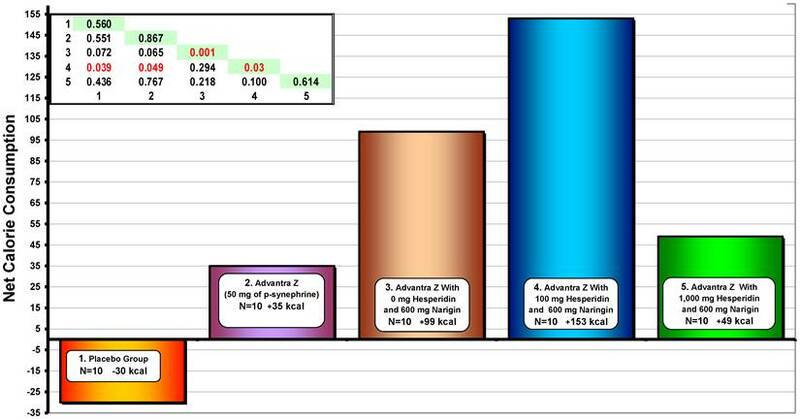 These data indicate that increasing the hesperidin from 100 mg to 1,000 mg reversed some of the thermogenic effects of 100 mg hesperidin in combination with 50 mg p-synephrine plus 600 mg naringin. It may be that in this case, more is not better, and increasing the amount of hesperidin constitutes an example of hormesis [30, 31]. The increase in the metabolic rate between p-synephrine alone and the placebo control was approximately 6.9 %. This increase in thermogenesis is similar to the increases reported in previous studies involving p-synephrine [17, 18]. The increase in RMR between Group 4, the combination of p-synephrine with 600 mg naringin and 100 mg hesperidin, and the placebo control is approximately 17.7 %. If one assumes that the product was taken twice a day for one year, the theoretical increase in calorie consumption would amount to over 31 pounds. However, the actual extent of weight loss if the product was consumed under these conditions remains to be determined. The mechanism by which naringin and hesperidin increase the thermogenic effect of p-synephrine may involve enhancing the expression of adiponectin which is known to play a role in lipid and glucose metabolism. Liu et al. have shown that naringenin and hesperetin up-regulate adiponectin expression, and both activate the peroxisome proliferator-activated receptor-γ (PPARγ) which has been recognized as the master regulator of adipocyte differentiation. In addition, naringenin also possessed significant ability to activate PPARα , a major regulator of lipid metabolism in the liver. Products with thermogenic properties are frequently associated with elevated blood pressures and heart-rates. p-Synephrine is a phenylethylamine derivative with some structural similarities to ephedrine, and is thus assumed to exert cardiovascular effects by many authors [see for example, 20, 21, 33-35]. However, no effects on heart rate or blood pressure were observed in response to p-synephrine or p-synephrine in combination with naringin and hesperidin (Table 2). p-Synephrine differs from ephedrine in that it has a hydroxyl group on the para position of the benzene ring and lacks the methyl group on the side chain of the molecule. These structural differences greatly alter the pharmacokinetic and receptor binding properties of p-synephrine, resulting in little or no cardiovascular effects , as confirmed by this study. No adverse events have been directly attributable to bitter orange extract and p-synephrine [36, 37]. However, caffeine is commonly present in products that contain p-synephrine [19, 28], and is well known to produce cardiovascular effects , particularly in caffeine-sensitive individuals . The absence of changes in blood pressure, resting heart-rate and self-ratings in the four treatment groups involving p-synephrine, naringin and hesperidin relative to the placebo group is very positive, and in conjunction with the increased thermogenesis may result in the development of beneficial products with respect to weight loss and weight management. The findings were further substantiated by consistency of the results across all four treatment groups. However, longer term studies are required to assess the amount of weight that is actually lost in response to these products, and to provide information concerning safety when used over an extended period of time. A problem faced in studies of thermogenic effects is that noticeable changes in the mood states listed in Table 1 often make subjects aware of whether or not they are receiving a placebo, thus undermining blinding of the study. The lack of significant differences between the treatment groups and the control group with respect to the self-report ratings of symptoms increases confidence in the safety of the combination as well as in the blinding procedure used in this study. Strengths of the study are the use of randomized placebo-controlled double-blinded study design, the absence of thermogenic changes in the placebo group, the absence of adverse effects on blood pressure, heart-rate and self-reports in the four treatment groups, the consistency of the effects of p-synephrine on metabolism in all treatment groups, and the increases in RMR in the treatment groups. The weakness of this study is the small number (10) of subjects in the placebo and in each of the treatment groups. The study also reveals an interesting effect with respect to hesperidin where an increased amount may lead to a masking of the thermogenic effects found with lesser amounts. This randomized double-blinded placebo control pilot study supports the safety and thermogenic effects of p-synephrine, particularly when combined with 600 mg of naringin and 100 mg of hesperidin. No increase in heart rate or blood pressure was observed over the 75 min. of the study nor were there any differences in a self-reported rating of 10 common symptoms between the treated and placebo groups. The data suggests the combination of the flavonoids naringin and hesperidin with p-synephrine may assist weight management. Further studies are required to determine optimal doses as well as safety and efficacy associated with long term use. This study was supported by a grant from Nutratech Inc., West Caldwell, NJ. HM is an employee of Nutratech, Inc. SJS and GHP have served as consultants for Nutratech, Inc.